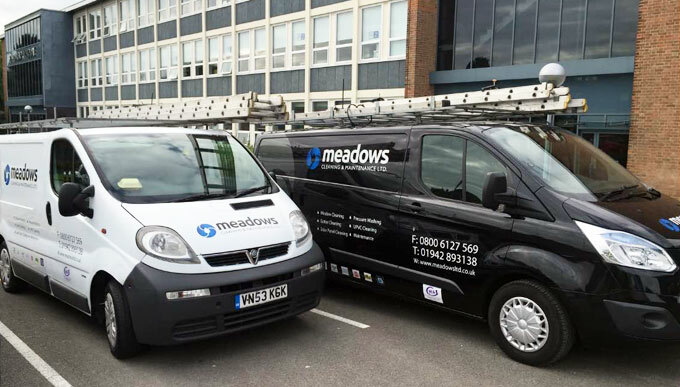 Meadows Cleaning and Maintenance Ltd. are a professional window cleaning company based in Atherton, Manchester, near Wigan and Bolton, with over 20 years experience of cleaning and maintenance. Meadows offer various domestic and commercial window cleaning and maintenance services including reach and wash window cleaning, traditional window cleaning, high rise window cleaning, uPVC cleaning including conservatory roofs, solar panel cleaning, driveway cleaning and pressure washing, gutter cleaning and property repairs. All our staff are fully trained and qualified and our professional approach makes us stand out from other window cleaning companies, cleaning companies and maintenance companies in Manchester, Wigan, Bolton and the North West. Our ongoing commitment to health and safety ensures all our cleaning and maintenance work is carried out safely, to recognised guidelines, and to a professional standard, as you would expect from a professional window cleaning and maintenance company. All our cleaning and maintenance teams work within a proven quality system that delivers a consistent, quality cleaning and maintenance service with hourly, daily and weekly work schedules to ensure on-time arrival and completion of all jobs. We always present a quality control form on completion of each job to maintain our high levels of customer satisfaction - and our Managing Director also carries out regular, unannounced quality control visits. In May 2009 Wigan Council Trading Standards officially launched the new Wigan Good Trader Scheme and Meadows Cleaning are proud to be part of it. To earn their Good Trader Scheme "badge", traders agree to tick the right boxes when it comes to consumer protection and other relevant legislation, and commit themselves to dealing fairly and honestly with their customers. The scheme is administered by Trading Standards, but it's customer satisfaction that counts! Customers award the scheme members a star rating of up to five gold stars - and the more satisfied the customer, the better the business rating. Members' details are held online at www.wigan.gov.uk/goodtrader where you can search for traders and see how other customers have rated them by looking at how many stars they've been awarded. The council Good Trader Scheme now boasts more than 200 members and they all form part of the special directory available on the council's website that lets customers know where to go for a fair deal.